Manila, Philippines - Online recruitment website JobStreet released the list of top 10 industries with better salary in the Philippines for 2014. The annual salary report aims to help candidates and employees gauge which industry has the highest paid employees and the corresponding average salary per job position. Now, will you apply to a job that doesn’t give you a better salary? With the help of JobStreet.com’s new feature called Salary Matching, candidates can now see which jobs, companies, and industries give better pay. All companies posting through JobStreet.com are encouraged to include the salary offer on their job ads, making the salary information visible to those applying. Are you one of the highest-paid managers, supervisors and junior-executives in the Philippines? JobStreet says that managers in the Oil and Gas Industry are the most paid in this position level, with PhP 74,297, followed by Managers in the Utilities Industry (PhP 74,067) and Industrial Machinery Industry (PhP 69,063). 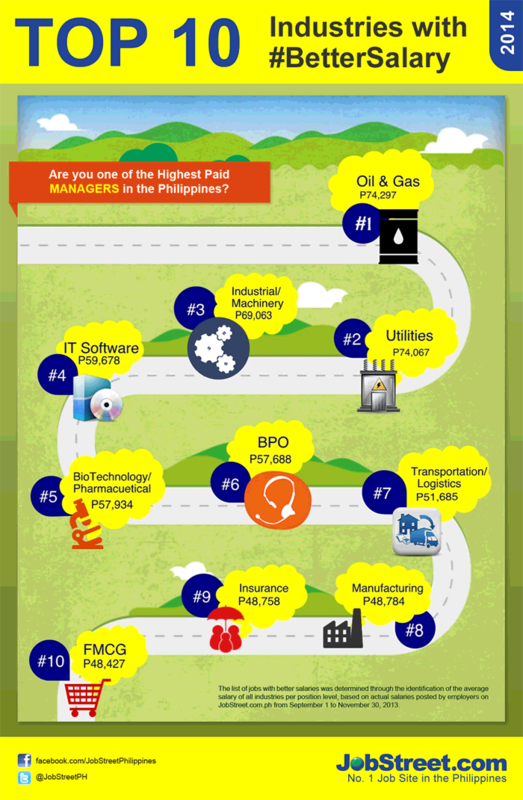 Completing the top 10 with highest paid managers are those in IT Software (P59,678), BioTechnology/Pharmaceutical (P57,934); Business Process Outsourcing or BPO (P57,688); Transportation/Logistics (P51,685); Manufacturing (P48,784); Insurance (P48,758); and Fast Moving Consumer Goods or FMCG (P48,427). Supervisors from the Utilities industry receive PhP 50,411. NGO Supervisors get PhP 43, 165 while the average monthly salary of those working in the IT Software industry is PhP 34,679. Completing the top 10 list of highest paid supervisors are those in FMCG (P30,751); Telecoms (P29,041); Banking and Finance (P28,779); Advertising (P28,238); Oil and Gas (P27,055); and Hotel (P26,952). With an average salary of PhP 25,697, Junior Employees (1-4 years of experience) working for NGOs are the highest paid, followed by Junior Executives from the Utilities Industry who get PhP 24,400 and the IT Software Industry with PhP 23,671. Other industries making the list of highest paid junior executives include IT Hardware (P20,721); FMCG (P20,131); Oil and Gas (P19,848); Banking and Finance (P19,135); Mining (P18,893); and Media (P18,853). The list of jobs with the better salaries has been determined through the identification of the average salary of all industries per position level, based on actual salaries posted by employers on JobStreet.com.ph website from September 1 – November 30, 2013. Meanwhile, basic salaries presented by Jobstreet did not include other forms of compensation such as leave credits, medical benefits, insurance, and incentives. Those who are self-employed, such as doctors and lawyers, were also not included in the list.